Tom Buchkoe is a third generation Yooper and a native of Marquette. He graduated from Bishop Baraga HS in Marquette and earned a BA degree in Art from St Johns University in Collegeville Minnesota. He spent ten years working at the Marquette Mining Journal and the Ketchikan (AK) Daily News before starting a freelance photography career. His work has appeared in hundreds of publications including: Alaska Magazine, The New Your Times, The Washington Post, The National Inquirer, Michigan History, Michigan-Out-Of-Doors, Outside, Lake Superior Magazine and Midwest Living. He has received numerous awards for his work including being selected as a member of Who’s Who among executives and professionals. Tom keeps busy shooting for commercial, industrial and travel clients as well as doing aerial, scenic, underwater and product work. Digital restoration, logo design and brochure work are among his services offered. A limited amount of wedding, portrait and senior photography are also available. He is also owner of the Yooper Postcard Company which produces and sells humorous postcards making fun of Yoopers. They can be purchased in over 100 stores in the UP and at yooperpostcards.com. When not working, Tom enjoys camping, boating, scuba diving, and dirt bike riding with his wife Barb. Their twin sons, Mike and Eric, are graduates of Northern Michigan University and live in Minneapolis MN and Racine WI. 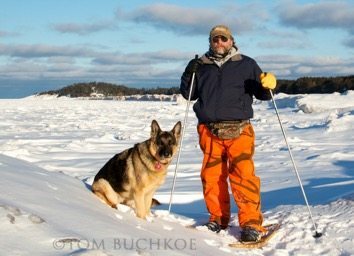 You can contact Tom at 906-226-3459, PO Box 852, Marquette MI 49855, or e-mail him at tbuchkoe@chartermi.net or visit his website at http://www.buchkoe.com.